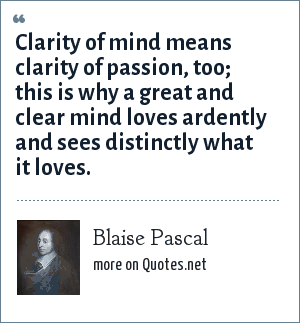 Blaise Pascal: Clarity of mind means clarity of passion, too; this is why a great and clear mind loves ardently and sees distinctly what it loves. Clarity of mind means clarity of passion, too; this is why a great and clear mind loves ardently and sees distinctly what it loves. "Blaise Pascal Quotes." Quotes.net. STANDS4 LLC, 2019. Web. 23 Apr. 2019. <https://www.quotes.net/quote/37952>. Help build the largest human-edited quotes collection on the web!